This is the first time this image has been published, although it has been on the back of a few Goliath 'Advelopes'. Along with the Sarcasm recall notice it was to be one of the adverts at the back of Lost in a Good Book. 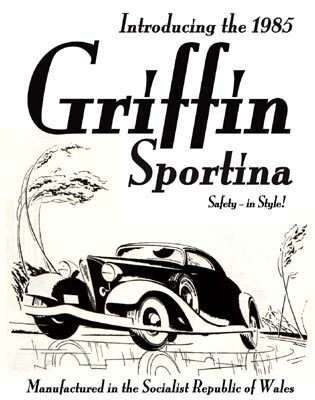 This is the 'Griffin Sportina' that Bowden drives, as described in Lost, and is made in Wales. In Eyre Griffin cars are described as 'drab coloured' but export versions are a lot better. One can be seen in the back of LGB 037 and in LGB 030, although only partly. No editions as yet, B&W.